Warning: A wonky, but thankfully short, post follows. Yesterday, the Naked Capitalism blog reposted some recent research by OECD economist Eduardo Olaberria that looks at the effect of capital inflows on bubbles in assets, particularly housing. With so many other signs of a housing bubble forming in Canada, I decided to quickly see if the dangerous trends highlighted in this report are present in our economy today. First, a quick recap. Several previous studies have found the same correlation between capital inflows and housing price booms; however, they merely used the current account balance (the measure of whether a nation is exporting more than importing or vice versa) as a proxy for capital inflows. 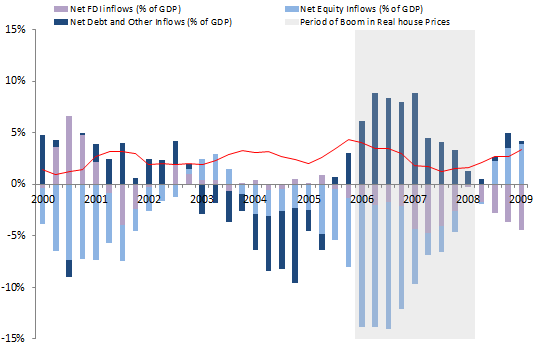 Olaberria takes the analysis one step further and looks at the different kinds of capital inflows themselves, relating each of these to housing price booms to see whether some kinds of capital flows matter more than others. While Olaberria also found that a large current account deficit is significantly correlated with a higher chance of a boom, a larger deficit raises the chance of a boom by less than 10%. Only after breaking up the current account surplus into its components is it possible to see factors that are can more dramatically impact on growth in house prices. Crucially, large inflows of debt-related investment more than double the chance of a boom. For example, in a normal period, because the owners of debt-related assets have more (potentially damaging) information, borrowing against those assets will be limited by careful lenders. The cycle of rising asset prices leading to greater inflows is particularly liable to occur around debt-related assets and is also particularly dangerous. Now back to the situation in Canada. Unlike other countries with rapidly-growing housing values in the early 2000s, Canada’s real estate market did not experience a significant correction following the 2007-8 crisis. Indeed, housing prices have kept rising steadily, with most house price indices showing them to have more than doubled since 2000. Institutions, economists and the media are increasingly making reference to a housing bubble that is either well on its way or already here. The IMF recently singled out Canada as having the most overvalued housing market amongst OECD countries. The Wall Street Journal cited a crash-prone housing market as one of the reasons Canada “can’t do anything right” economically lately. Finally, Canada has had the dubious honour of making Nouriel Roubini’s list of countries with likely housing bubbles. In this context, I figured it would be worthwhile to see if the mechanisms described by Olaberria might apply to the Canadian economy in the present. Figure 1. Current account balance and capital inflows in Canada (click image for larger version). Source: Statistics Canada. The graph above shows Canada’s current account balance and disaggregated capital inflows since 2000. Notice the abrupt transition to current account deficit and a steady stream of debt-related inflows since 2008 – precisely, the conditions that most increase the risk of a housing bubble developing. In fact, this graph looks eerily similar to the next graph, which comes from Olaberria’s post and demonstrates a typical example of capital inflows fuelling a housing price boom (in this case in Denmark). Figure 2. Capital inflows during a housing boom in Denmark. Source: Naked Capitalism. Although Canada’s house prices have been rising steadily since 2000, bubble conditions seem to be developing to a greater extent since the crisis of 2007-8. Until the crisis, the entire global economy was in a phase of growth that sustained higher asset prices. The crisis showed that growth to have been largely illusory and housing bubbles burst in the US and across Europe. Since then, Canada’s economic fundamentals have weakened considerably. GDP growth, employment and investment are all stagnant. Even our venerable resource sector is on shakier ground. Despite this, house prices have kept on rising. Domestically, household debt is expanding apace and is now at record levels. The influx of debt-related capital from outside Canada is only adding further fuel to the fire, driven by newly-created money from across the globe looking for outlets. In these conditions, a housing bubble seems increasingly likely, but our government has been happy to preside over debt-fuelled growth based on rising asset values. Housing prices in Canada have been defying expectations (including mine!) for so long that there must be something else going on. With wages and the income share of labour suppressed, we’re in a world awash with capital — and that money has to be parked somewhere. Following the financial crisis people are of course wary of the speculative nature of stock markets, returns on bonds and short-term paper are low, so people are putting it into cash (up $250 billion since 2007) into real estate (up $270 billion), land (up another $250 billion) as well as cars, and household fixin’s (up $40 billion). These account for pretty much all (and more) of the increase in net wealth of households since 2007 (see Cansim 378-0051). At least these are all mostly tangible and won’t completely disappear into thin air as a result of some financial manipulations or shenanigans. Foreign inflows of capital are no doubt playing some part especially in certain markets, but a lot appears to be domestic capital — and this isn’t just a Canadian phenomenon, with other real estate markets also getting elevated again so soon after their recent crashes. I think you’re right that inflows of outside capital are not having a huge effect on housing directly, i.e. most of the foreign capital coming in is not going into real estate. The argument is that foreign inflows, especially into debt-related assets, are highly correlated with real estate booms. The causality, however, usually does not go directly from capital flows to real estate prices. Both are likely the result of a background cycle of the kind described in the paper where asset values of all sorts start to explode simply because people start to believe that they are worth more and so are willing to leverage them for more. Although this indirect relationship is usually the case, it would be interesting to see how much of a direct relationship there was in the most recent crisis in the US crisis, as so much of the asset boom was based on mortgage-backed securities, including CDS, etc. and there was so much foreign dollar-denominated capital floating around globally due to US external deficits. I agree that this is not the situation in Canada at the moment (and may not have been in the US). There is just generally lots of capital around in the economy, whether foreign or domestic, and this is boosting all manner of assets. Another reason more foreign capital might be coming because our real rates, while low, are still likely higher than the others who are practicing aggressive QE. And still lots of domestic capital around because of the explosion of household debt and corporate cash reserves (the high-profit, low-investment situation I’ve been harping on about!). All this is fueling booms in assets across the board including in real estate, even though the housing boom in particular, as you point out, most certainly is almost exclusively coming from domestic capital. Regardless, the vicious cycle seems to be going strong. On a side note, I imagine large parts of the foreign capital might be going into corporate bonds, which are being issued in vast quantities. Over $100 billion issued so far this year (see this article in The Globe and Mail) and still going strong. Corporations happy to issue debt as long as there are buyers, but the money, again, isn’t going into investment but financial transactions, largely debt refinancing, some M&A.